Courage, a 10-year-old Dachshund with a graying muzzle, is usually fast on her feet—active and frisky despite her age. But soon after Thanksgiving, her family—siblings Michael and Donna and their parents—noticed Courage, or “Curry” for short, was drinking more water than usual, urinating more often and moping around the house. 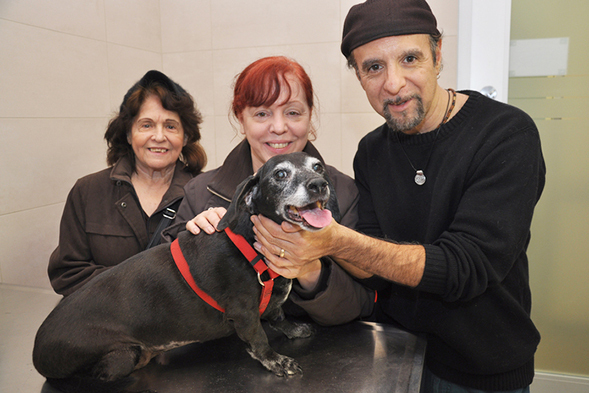 Two days later, at the ASPCA Animal Hospital(AAH), Curry was diagnosed as diabetic. Curry’s symptoms are common among pets with diabetes, a disease that occurs when a body does not make enough or respond normally to insulin, a hormone manufactured by the pancreas that controls blood sugar levels. The precise frequency of diabetes in dogs and cats is not known and can vary depending on the breed, but it is seen in both species. In dogs, diabetes is more common in females; in cats, it’s slightly more common in males. Dr. Murray says canine diabetes can also occur as a side effect of medication, particularly steroids. It can also result from certain diseases like Cushing’s or an excess of certain hormones, which sometimes happens when a dog is not spayed. Diabetes in felines, on the other hand, is more similar to Type 2 diabetes in humans. Its most common causes in cats: obesity and an excess of carbohydrates in the diet, which exhaust the pancreas. It can also occur in cats with pancreatitis or who are given steroids. Feline diabetes can be reversible with insulin administration, a high protein/low-carb diet and maintenance of a healthy weight, allowing the pancreas to rest and regain the ability to manufacture adequate insulin. But diabetes will recur if cats go back to an inappropriate diet. Unfortunately diabetes is not curable in dogs, and the vast majority of diabetic dogs require insulin injections for life once diagnosed. However, addressing underlying causes, as well as spaying females and treating Cushing’s disease, can allow the diabetes to be more easily and successfully controlled. “Diabetic pets can have a wonderful quality of life if their owners commit to giving them twice-daily insulin injections and monitor them closely,” says Dr. Jill Pomrantz, an internist at AAH. After her diagnosis, Curry began receiving treatment is back to being her bubbly, high-spirited self. Donna, who has had experience with diabetic pets, administers Curry’s twice-daily insulin shots and monitors her glucose levels. “I know this process is not fixed overnight, but she looks much better and is more energetic,” Donna says. “The hardest part is not caving in to her pleas for treats all the time.” Curry loves celery, however, so that’s often provided as a substitute. Please visit our Pet Care section to learn more about diabetes in dogs and cats.